I don’t know how I can stand before you today with any sense of integrity and faithfulness and not say something about the Florida shooting. Something has to be said. I’m just not sure what to say or what can be said. I’m struggling with that. And I have been since my Ash Wednesday sermon. We’ve been through this before and it never gets easier. I could go back to old sermons and prayers offered in previous circumstances like this, change the names, and call it a day. I’ve got plenty to choose from. I could join in the usual responses at times like this and offer thoughts, prayers, and condolences but that stuff is getting pretty old and tired. And that doesn’t mean I am against prayer and compassion. But why can we not enact our prayers and compassion with change and actions? I could again plead a case for reasonable gun control and better mental health care. I could ask the usual questions: What causes these tragedies? How do we prevent them? What are we going to do now as a country, as a church, as individuals? But we continue asking the same questions, having the same arguments, and offering the same answers. Meanwhile people are dying. I could blame the NRA and politicians, the FBI, or our society in general. But that seems like a distraction and one-upmanship. Who do I want to be in light of this most recent shooting? Who do you want to be? What does it mean to be a Christian at this time and in these circumstances? That’s personal. That’s about each one of us. The gospel isn’t just a nice story about Jesus that gets read on Sunday. It’s a choice, a temptation, a way of being. Who do we want to be? It’s the kind of question that arises in the wilderness of life. Here’s another way of asking the question: What does our baptismal identity look like and mean in the wilderness? That’s the question with which Jesus is struggling. He was baptized and immediately the spirit drove him into the wilderness. Our baptismal identity is always at risk in the temptations. And I don’t mean that God might withdraw or cancel that identity but that we might set it aside and become someone other than who God has declared us to be. That’s the issue in today’s gospel (Mark 1:9-15). At Jesus’ baptism God declares Jesus to be God’s Son, the beloved, with whom God is well pleased. That is Jesus’ baptismal identity. That’s who he is before he ever enters the wilderness, before he ever faces the first temptation, before he ever teaches, heals, preaches, or walks on water. Now he must learn what that means in the wilderness of life. It’s one thing for God to believe and declare Jesus to be the beloved Son with whom God is well pleased, but it’s another for Jesus to believe that for himself, and let everything he does arise from that baptismal identity. That’s the temptation and struggle in the wilderness. It was for Jesus and it is for us. And today that wilderness is a mass shooting at a high school in Florida. We have once again stepped into the wilderness of gun violence. The wilderness temptation, however, isn’t so much about choosing what we will do or not do, but choosing who we will be or not be. The identity we choose will determine what we do or don’t do. Do we choose our belovedness or do we choose something less than being the beloved? Jesus didn’t go to the wilderness to prove something to God but to learn for himself who he is, what it means to be a beloved child of God, and the cost that carries. That’s true for us as well. That’s our wilderness journey whether in the wilderness of gun violence, the wilderness of a broken marriage or friendship, the wilderness of chronic illness, the wilderness of sorrow and loss, or the wilderness of a shattered dream. The wilderness tempts us to forget who we are or to believe we are less than who God has declared us to be. The temptations we face come from within not from outside of us. The deceiver and the adversary that tempts is a voice from within us. See if any of this sounds familiar. Have you ever acted a particular way and presented a particular persona in one situation or with one group of people but in a different situation or with a different group changed how you acted or the persona you presented? Haven’t there been times when you were conflicted, one part of you said this and another part said that? Have you ever claimed a particular value or belief for yourself but then said or did the exact opposite, contradicted your own values and beliefs? Have you ever kept quiet and been afraid to speak the truth because it was unpopular or costly? Do you ever go along just to get along? Have you ever looked in the mirror of life and not recognized yourself or not liked what you saw? Have you ever wanted to be more than what you had become? Ultimately, those conflicts and contradictions are about our identity. If we are baptized into the life of Christ, declared to be beloved children of God; if that’s our given identity shouldn’t it also be the identity that governs who we are, the words we speak, and the actions we take? Shouldn’t that be the thread that runs through our life with all people and in all situations? Shouldn’t we be and act like God’s beloved in this current wilderness? The wilderness of life is where we face the truths and untruths about ourselves. It’s where we discover for ourselves who we are and to whom and what we give our loyalty. It’s where we see the values that govern our lives. I wonder what truths and untruths about us individually, as a nation, and as a church are being revealed by the Florida shooting. Who have we become that these types of shootings continue? Is that really who we want to be? I want us to be more than that. We are better than that and our baptism asks more of us than that. Are we Christians in name only but not action? On Sunday mornings in the church but not the rest of the week in the rest of the world? We happily wear Christ’s cross around our necks but are we willing take up our own and follow him? Are we unwilling to deny ourselves and pay the cost it takes for another to live? What would taking up our cross look like in light of the Florida shooting? 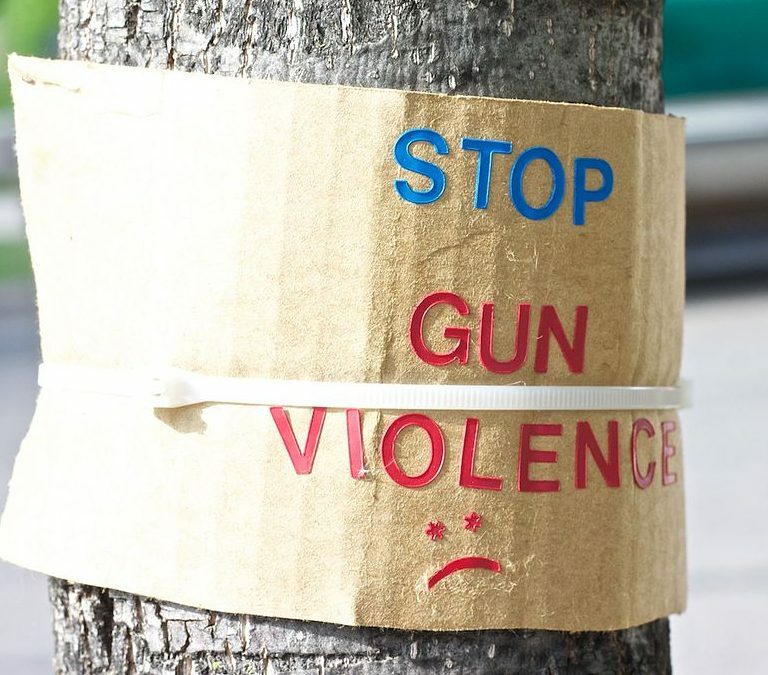 What does repentance mean in the wilderness of gun violence? At what point do we risk betraying our baptismal identity? Have we reached that point? I do not ask those questions as a judgment or criticism of you or anyone else. They are the questions in my head and the struggles in my heart. That’s all I’ve got to give you. I have no answers. I have only my baptismal identity, the wilderness, and my struggle to put the two together. Who do we want to be? Do we truly want to be and live as the beloved children of God? Those are more than just questions to be answered. They are choices to be made and lived. We choose our belovedness. We choose the belovedness of one another. We choose the belovedness of those who died and those who now grieve. And, yes, we choose the belovedness of Nikolas Cruz. What does that choosing look like in your life? Who do we want to be? And the second amendment was never intended to make it easier for deranged people to buy automatic weapons designed primarily to kill people. It was intended to make it legal for each state to have a “well regulated militia” to keep order and safety for its citizens. Too many people have seized upon the second clause of this amendment and used it for an excuse to sell weapons. I guess that there is no idea that is so good that it cannot be missed up. The current twisting of what was intended as a measure to maintain order and safety has been warped warped warped. I have always tried to be a ‘what you see is what you get’ sort of person. I tend to be outspoken by nature, and have had supposedly open-minded, educated relatives, friends, co-worker tell me things like, “I always thought you were too intelligent to believe in God.” Is it any wonder that so many who hold non-PC, non-athiest views remain silent in their dealings with the intolerant. My opinions about gun ownership are nuanced and do not lend themselves to short sound bites. Often I have been interrupted by those who don’t even want to hear what I have to say. First off, I am not a gun owner. Never will be. However, let me point out that comparing gun violence here is often compared with gun violence in countries with stricter gun laws, and use this as proof that easy gun ownership leads to more gun violence. No one wants to include Switzerland, where the law requires every household with a male resident between the ages of 18 to 65 to have and maintain a rifle and ammo. Why are the Swiss not shooting each other with reckless abandon? Indiana has loose gun purchase laws. Why are people of that state not killing each other the way people in Chicago, Illinois, with its strict gunlaws are? Something besides gun laws is going on. Yes, maybe we should ban AR-15’s. Those who oppose a ban see this as the thin edge of the wedge to ban more guns. Surely easy access to guns is not good for our country. Neither is the wide-spread violence and mayhem on television, in movies, and in video games. Last night, to get away from the news, I began watching a marathon presentation of ‘NCIS Los Angeles.’ All shooting, all killing, all the time. Wow! Finally, perhaps because of the political power of big pharma, there has never been a serious study of the role played by mind-altering meds on violence. Whether someone is still on these meds, or has stopped them, these drugs have great capacity to mess with one’s judgment. Just listen to all the cautions given when these meds are advertized. (A personal note, back in the early 1960’s my mother was prescribed Librium and Valium for her ‘nerves.’ She heard a radio program that said these drugs were bad. She stopped them, cold turkey, without telling her doctor. For at least five years after that, she was certifiable any three random days of the week. I was a teenager. It was hell. I am now 73 years old and can still hear her screaming rants and recall her wooden coat hanger throwing fits. For no reason. Well, that’s off the top of my head this Monday morning. Thank you for your patience. I don’t live in your country or pretend to understand gun crime but we all experience our own “Wilderness experience” throughout life and we definitely need to consider what being a child of God mean for us. We need these experiences to grow and gain wisdom but it is only of use if we use what we learn and fight for what God wants. I live Australia. In 1996, the Port Arthur Massacre occurred in one this nation’s most important and historic site. At the time, our Prime Minister was a very conservative man. His name is John Howard. The issues the citizens of Australia faced at this time can be read here. https://www.aph.gov.au/About_Parliament/Parliamentary_Departments/Parliamentary_Library/Publications_Archive/CIB/cib9596/96cib16 I think I am fairly safe in saying that the majority of Australians do NOT understand how you allow your citizens, particularly children and young people, to be sacrificed for the protection of the gun and all your National Rifle Association (NRA) to dominate your political life. There are still Australians who are unhappy with our gun control but they are overwhelmed by the majority of the population – who come from a variety of political positions. Jesus asked for us to suffer the little children to come unto him … but it seems to me that in the USA there are sections of the population who don’t understand the words that come after the word suffer. The only correct answer is that people are being asked to sacrifice … to sacrifice so that others, particularly children, can live. What is wrong with that? I live in the UK and from here it looks like there are a lot of people in America who like violence, guns, white supremacy and the like. Even in the christian church it seems. I have prayed for your president, tried to touch his heart. That was interesting. I thought it was brave of Fr Mike to try a different response to this latest act of gun crime and asking myself the questions he posed let me to admit that there is a bit in me that likes?/is fasinated with guns and violence too already from a young age and which needs to be questioned. That bit of death culture I can work on and should. In silence and alone. But you guys in the States definitly need to stand up against this gun menace. Maybe use your power of imagination and picture a (wo)man of the stature of Ghandi to lead a movement to change. Picture this person and ask your angels to take it to God, ask Mary who sits at His feet but will turn her head to you when you call her name. Turn despair into hope. Michael: I’m a new reader of your super website. You are a kindred spirit. Clearly, children in America are the ones who are clear-sighted. Please listen to their wisdom. Mike, I think you and I are “singing off the same sheet of music” regarding the necessity for Christians to take a stand for doing something to stem the river-flow of gun-related violence, and you have received thoughtful comments on that already. So I want to focus on another aspect of this sermon.